We went to Cairo after our trip to Dubai. I guess it is not a surprise that the main purpose of our journey was to climb the Cheops Pyramid. Without any specific plan, myself, Vitaliy Raskalov and Marat Dupri came to the capital of Egypt. Ahmed met us in the airport. Ahmed is one of the locals who have agreed to show us Cairo. First thing he told us on our way to the city center was about the sandstorm, which took place the day before our arrival. He said we were lucky not too see it. Then he started talking about local color, about protests in the city. On the question of what is to be feared today in Cairo, he said that we should avoid the Tahrir Square, which was occupied by protesters. What surprise was when it turned out that the hostel we have booked was located just 50 meters from this place. It was quite pleasant and inexpensive “The Canadian Hostel” with huge rooms. Talaat Harb Square, located next to Tahrir Square. Ahmed was surprised with purposes of our journey. He understood why we wanted to climb the pyramid, but cound not get why do we need city views from the hights. Despite that, he offered us to have a look at the city from the viewing platform, located on the TV tower. A view from the observation point. To get there, by the way, a tourist from the abroad has to pay twice as much then the local one. Egyptian Radio and TV office. Burned during the riots building of ruling National Democratic Party. A view from the TV Tower. The height of the tower is 187 meters. On this shot you can see the highest building in Cairo. We have climbed it after we finished with the observation desk. After getting down from the observation deck, we decided to have a snack. We had to go by foot because traffic jams were just terrible. Also Ahmed said that to park your car where you want, you have to be really lucky: sometimes one has to park a couple kilometers away from where he needs to get. While passing the highest building in Cairo, we have proposed Ahmed to climb there secretly. It wouldn’t be too complicated: it was still under construction. Our Egyptian friend laughed and did something we did not expect. He led us inside, found the guard, had a small talk with him in Arabic and told us to go upstairs. So that’s when we saw with our own eyes the magic power of the word “baksheesh”. To make it clear, baksheesh is a bribe. I am positively against all that kind of stuff, you know. I don’t invoke you to bribe by no manner of means – I just want to say, that everything in Egypt is so corrupted that baksheesh works almost always and everywhere. If you’ve got the money, you can do whatever you want to. From the above we could see an endless compact city. Above it there was the smog, which cannot be compared even to the one in Moscow, so the sun at sunset was barely visible and our attempt to make some pictures of bright colors of the setting sun had failed. Such smoke is everywhere in the evening. Note that I’ve increased the contrast a lot. The picture shows the Cairo Tower, from which my first photos were taken from. The history of this tower is quite amazing. It was built on the money, which U.S. intelligence services tried to bribe Gamal Abdel Nasser, the Egyptian president at that date. In the mid-50s the CIA resident in Cairo (his name was Miles Copeland) had tried to bribe Nasser by passing Hassan Tuhami, the Council member of leading the revolution, 2,999,990 U.S. dollars. But Hassan Tuhami did not give the money directly to Nasser, he gave it to General Naguib, enraging Nasser, known for his intransigence attitude towards corruption. By his decision, the money was withdrawn from the General Naguib and handed over to the Board of revolutionary leadership. At the Council meeting various proposals on how to spend this money were considered. One option was to set up a monument of Sphinx with a huge nose and a thumb, attached to it. Four other fingers had to be staring at the sky – an allusion to the fact that Americans are left holding the bag. At the suggestion of Nasser, it was decided to build a television tower so high that it will be visible from all over Cairo. Americans mined the tower to blow it at the moment of Nasser’s visit, but security services uncovered the plot. Roofs of Cairo. Dirty and all covered with satellite dishes. Density of construction in Cairo. The whole time we were on the roof, two guards were following us. They’ve tried to scrounge more baksheesh from Ahmed. They forbade us to approach the edge of the northern side of the roof, explaining that we can raise the suspicion: if the police will see us, they will take us for the demonstrators, preparing another protest, and then everyone will have problems. I don’t know if that could be true but the guys were insistent. Just before the magic hour we had to go down as the guards started asking for some bigger amount of money for such long stay on the roof. It was getting dark and we have decided to go back to the hostel and get some sleep. Upon arrival we figured out that the door is locked and two bums are sleeping just behind it. We knocked at the door and shouted a bit. The bums woke up and asked sullenly, who we are and what do we need. When we replied that we stay in the hostel, located on the floor above, they’ve smiled and kindly let us in, then they went back to sleep. I’m not sure but maybe they were security guards? This was the end of our first day there. The next day we were to face the real Cairo in all its diversity. Ahmed was no more with us and there was no connection with him. Since we wanted to climb the pyramids, it was decided to go there in the afternoon and reconnoiter the situation. We did not know will we climb there secretly, or will have to use the magic word “baksheesh”, or we will have to find a companion. On the way we stopped at the Tahrir square to have a snack and get to the subway. Area was occupied by exploded cars. Some places were surrounded by the barbed wire. In the center of the square was located a tent camp of protesters. It was strongly advised that we shouldn’t go there (especially making photographs) since people there really dislike photo reporters. They can even break our cameras down. Actually, we have opted to pass by without stopping when they saw mass fight inside the camp. Take a look at graffiti. Before we continue the story about our trip to the pyramids, I want to share my impressions of life in the Egyptian capital. Population is about 10 million people in the city and over 20 million people in the agglomeration. It’s kind like in Moscow. But the area of Cairo is almost 12 times smaller, than in Moscow! Just try to imagine it, it’s crazy! A relatively small area of Cairo is caused by very dense buildings. The population density is 36 143 people per square kilometer (Just to compare, in Moscow it is 10 580 people per square kilometer, which is 3.5 times less). So this makes Cairo one of the most densely populated cities in the world. Try to imagine the following: traffic jams are 3.5 times more annoying, queues are 3.5 times longer, and subways are 3.5 times more crowded. In Cairo you can get to the traffic jam even in the night time – verified fact. Overall, traffic is really chaotic. Almost no traffic lights, and even if there is one (we’ve heard that there are only 8 of them in the entire city), no one cares actually, if the signal is green or red. It is impossible to cross the road leisurely; you can only run over it. When a driver sees a pedestrian he is not slowing down at all. Streets are super noisy; drivers are honking to each other endlessly. Probably, the one who honked stronger is the right one in the disputable situation, or I don’t know how else I can explain it. Here we are in this anthill, among millions of people, most of whom do not speak English. While we were moving along the city, Arabs were trying to sell things to us. They get really encouraged seeing man of European appearance. Everywhere we were about to get tricked. In the shops sellers were trying to give us less change so we were forced to argue with them to get it – or name an obviously high price, but you can always try to bargain. Believe me, even if you are very sensitive and suspicious person, you still will be deceived. They do it really skillfully, but more on that I will tell you later. So, are you plunged into the atmosphere of Cairo? Entrance to the Saddat subway station at Tahrir square. For some reason there is no light. But the most amazing thing is that hagglers took advantage of this, they sell various glowing toys at the transition in complete darkness. In Cairo, a subway train has two cars that are for women only. When I started making photos of the train station, people looked at me really curiously, some of them even stared at me with frank condemnation. One dude started yelling something in Arabian. The reason was that actually, it is prohibited to make photos in the Cairo subway. From the metro station to the pyramids we had to go by taxi or local transport. At the station exit some guy started talking to us in English. He asked if we were tourists and if we were going to see the pyramids. We answered yes on both questions and he replied that he is going the same direction and will show us how to get there. We have decided to go by public transport to get some more of the local flavor. All the way there he was telling us different things. He said he lives not far from pyramids, but he works somewhere in the city center, so now he is on his way home, coming from work. He said he met us accidentally and just wanted to help. I did not believe him from the very beginning even though he was friendly and smiling a lot, and didn’t ask for any money. We have arrived somewhere not far from pyramids and the guy said that it’s already 4 PM and the complex works till 5 PM. He explained that now they already don’t let tourists inside but we can get quite close to the pyramids by camel or horse. Good luck, he has got a friend who can help us with camels and horses. So he escorted us to his friend and we spent some time communicating and bargaining. We were trying to figure out how close we can get to pyramids. When we found out that anyway we will not be able to get to the base of pyramids, we tried to cancel the trip immediately. It wasn’t that easy! We were leaving the guy’s office, but he was following us, lowering the price. I guess he did not get the reason why we didn’t want to rent his camels so he tried to interest us with nicer deal. As it turned out, it’s a common thing to get advantage of tourists with renting out horses and camels. And the guy with good English is standing next to this subway station every day, looking for tourists and telling them he is coming home from work. We have figured this out the next day, when we got there again and saw him at the same place. The only truthful thing he said was that after 4 PM tourists are not allowed to the complex. 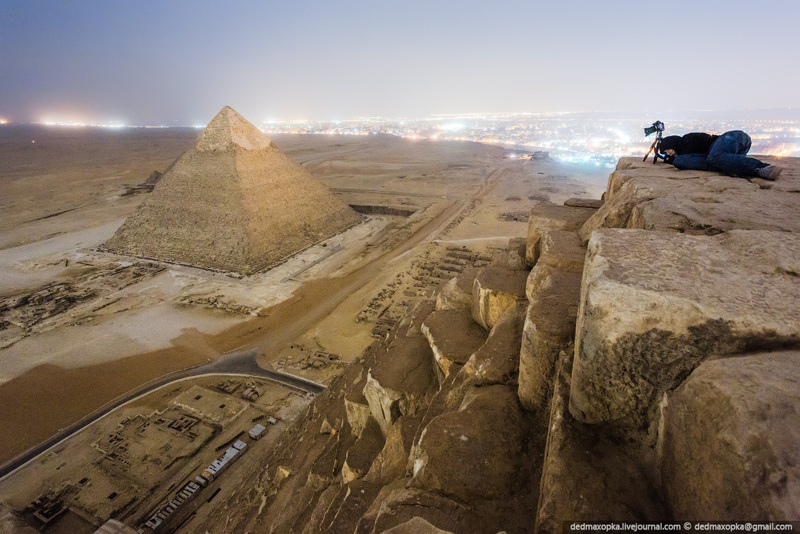 Since we really wanted to get on top of the pyramids, we have decided to use the magic power of the word “baksheesh”. We already had some good experience with “baksheesh”, so why not pay to get up – it wasn’t necessary to do it secretly for us, we just wanted to do it any possible way. Even though after 4 they didn’t let people in, next to the complex exit we saw several guys who offered to let inside for half an hour for a small fee. We have caught one, gave him the bribe and asked to conduct us inside. He really led us into the complex; we walked around the sphinx and went to pyramids. On the way there we asked him if he can help us to get on top of Cheops pyramid. He thought a bit and then replied that yes, he can do it – but in the night and it will be quite costly. Saying “costly” he meant one hundred dollars. So we agreed and he let us climb one of the small pyramids (as a proof he is not lying). Actually, I think we could get there with no permission at all. In conventional time and conditional place we met this guy. He was very attentive to the surroundings, asked for the money ahead, got them and immediately led us somewhere into the slums. It was the start of the most amazing deception in our trip. We started walking along the narrow streets, lust standing around and waiting for something. Then we went to the highway and traveled by bus a little. We ended up meeting some guys who were introduced to us as the security of the complex, they were aware of our business and were there to assist us. The guys looked at us and said that they often have issues with people climbing the pyramids, more than that, the last dude they’ve caught, looked exactly like me. Our guide said that in the night the general himself came to inspect the complex and he is dissatisfied with something. The guide looked really upset and told us that there is only one chance left to get inside. We had to get on horses and ride around the complex to get inside from the back of it. They gave us horses and we departed. I really liked this part: there was the night in the desert, the stars were shining bright, we were riding horses – it was beautiful. Sometimes the Arab riders were passing by with loud shouts: they were organizing the horseback night race in the desert. Sometimes we thought they were raiders who want to rob us, because the atmosphere was corresponding: the night, the desert, no one around us. Fortunately, all went well, we got to the desired entry, our guide went to the checkpoint to discuss our visit. Sometime later he came back and told us that the general is really mad and he is not going to leave the complex. He is still there and patrols the complex in his car in person. We had to go home – there is no way we can get to the pyramids tonight. So we went back to the very beginning of our short journey – the place we met the guide today. That’s when we realized that actually the general guy does not exist and all of it was just some beautiful game to make us get the horseback ride trip. The guide gave us the money back but asked to pay for the ride. Next day we decided to go straight there, by ourselves, and do not trust anyone anymore since everyone was trying to fool us anyway. We got to the desired metro station, jumped on the cab and headed to the complex. It was not the end of our adventures: closer the complex was, more often some dubious people were stopping our taxi trying to sell us the horseback ride trip. It was more than annoying and we asked the driver not to stop anymore. Finally, on our third day in Cairo we were next to the base of the Cheops pyramid. We started looking around, fighting off shopkeepers and riders. Some people offered to make a photo of us in front of the pyramids and all of a sudden asked money for the picture. Some people again (and again!) offered us camels and horses, but we were telling them, that we need an elephant – we do not ride all the other animals on principle. Going round territory, we found a secluded tomb, where it was decided to wait until nightfall. We spent there several hours, watching movies. When it got dark, we got out to watch the light show on the pyramids. To tell you the truth, I wasn’t impressed. Hundreds of mosques had spread the evening prayer all over the city. The atmosphere was indescribable. The entire city came to life again; all the sounds were interwoven into buzz and howl… Very creepy. It was time to implement our plan. Quite slowly, with a lot of stops, eventually we got to the base of the pyramid and started climbing it. Picked up a camera and made a shot. The blocks are about 1 meter height, the climbing was not too complicated, but slow – so it took us for about 20 minutes to get on top. Stumbling was inadmissible. We were trying not to stick out so that the security wouldn’t notice us. On the very top we faced an area of ​​several square meters. On the blocks were a lot of inscriptions in different languages. We spent there about half an hour, made several pictures and started getting down. Still, in the end we had to run away from the security, talk to them and so one – but all went fine and we got out of there eventually. After we got back to the hotel, we booked our flights back to Russia for the next morning. That was the end of one of my coolest journeys so far. In the beginning of my story I told you that a trip to Cairo can withdraw you from any depression and shake you out. If you have read the entire post, you can get why I am claiming this! Thank you for your attention! P.S. Please do not try to repeat.